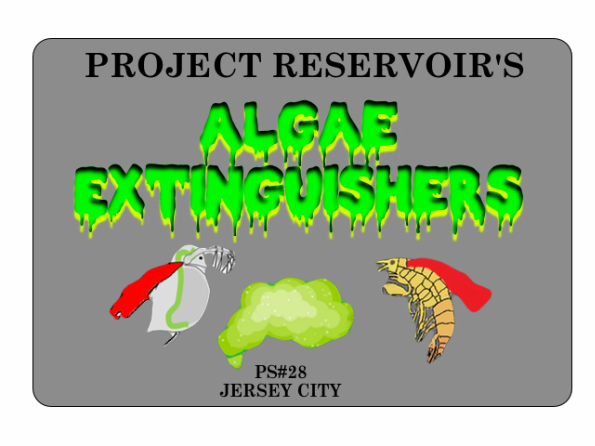 Our group's name is "Algae Extinguishers" and we are part of Project Reservoir. Algae Extinguishers is a group of three students currently; Giselle,, Adriana, and Kevin hoping to make a change. One day our team was walking around the reservoir and realized the abundant existence of algae and the nasty fumes it caused around the reservoir water line. We thought if we wanted to continue on making the Reservoir a pleasant space where students can conduct field trips and summer science STEM expeditions, perhaps we can do something about the massive presence of algae. We went to ask Mr. O'Donnell (Our science teacher / Project Reservoir coach) about it, and he explained to us what the algae is and we decided to do something about it. Due to the fact that we don't want to chemically treat the algae; we started to conduct our own research on how to remove it in a safe way. Our team started to gain more information about how to clear algae and Mr. O'Donnell introduced us to the algae clearing tag team - Daphnia and Amphipods - that was already in our school aquaculture lab. Daphnia are "water fleas" that clear the algae at its' source. Amphipods are invertebrate that clear the algae we visibly see. Our main goal is to get rid of algae safely in the reservoir without the use of chemicals. We found out that by using Daphnia and Amphipods, we were able to safely remove algae on a few tanks on our aquaculture lab. You can find out more information about this on our Research, Daphnia, and Amphipod pages. Currently, we are conducting further tests and doing more research about this dynamic duo. Click on Daphnia and Amphipods links to learn more about this!